The antioxidant properties of vitamin C (AKA ascorbic acid) and its role in collagen synthesis make the sunny-hued little beauty a vital molecule for skin health. Dietary and topical ascorbic acid have beneficial effects on skin cells, and some studies have even shown that vitamin C may help prevent and treat ultraviolet (UV)-induced photodamage. To break the news gently: you NEED the stuff on your face, as well as in your diet. Lucky for us there’s some clever skincare brands doing unique things with it, and formulas to suit every skin. The latest innovation in Vitamin C I’ve tried is from New Zealand skincare legends Trilogy, and comes in the form of a double whammy: a Vitamin C Booster Treatment and Vitamin C Moisturising Lotion. The new Vitamin C Moisturising Lotion is a super light, refreshing daily use hydrating lotion that harnesses the power of antioxidant-rich vitamin C to promote a brighter and even complexion. In addition, the inclusion of Trilogy’s most famous ingredient - rosehip oil - boosts hydration, while daisy extract helps to improve the appearance of pigmentation, giving skin that ‘lit from within’ look as the refreshing scent of mandarin oil awakens the senses. 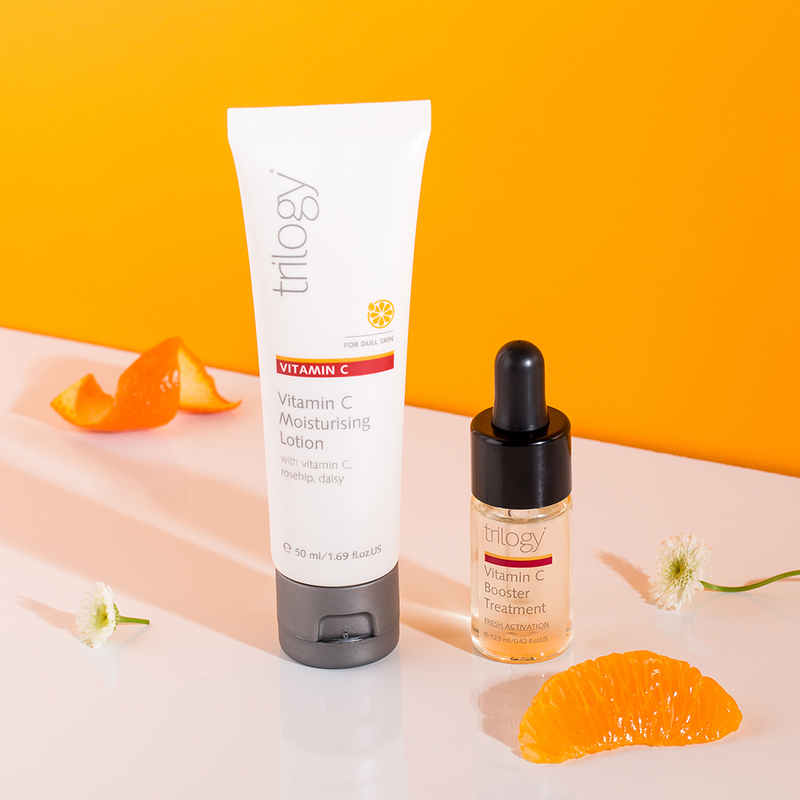 It’s beautiful under makeup and on its own, and is a nice solid go-to for those looking to enter the world of Vitamin C.
Now to add a next level boost to your new daily faithful: you use it in conjunction with Trilogy’s new Vitamin C Booster Treatment for a freshly activated, two-week intense brightening beauty treatment packed with high potency natural vitamin C powder in its freshest and most active form. Vitamin C is always at its most active when it’s fresh, so this little booster includes a unique dispensing mechanism which pops with freshness when the 100 per cent pure vitamin C powder is released into an ultra-hydrating hyaluronic acid concentrate enriched with daisy extract, rosehip and mandarin oil. The fresh activation ensures the powder’s potency levels are at their optimal level to deliver maximum skin brightening results. Once activated, the treatment is designed to be used twice daily for two consecutive weeks to visibly boost the skin’s own unique glow and to help improve the overall appearance of dull and tired skin. This makes it perfect for use before an important event, or as a real pick me up when you think your skin needs it most. To use it, pop the cap and give it a good shake. Then, carefully remove the cap and replace it with the pipette dropper you’ll find in the pack. Apply 3-4 drops to clean face, neck and décolletage morning and night, followed by your go-to Vitamin C Moisturising Lotion. In two weeks’ you’ll see some pretty magical results, and both products are suitable for pretty much all skin types. Last up, Vitamin C taken internally is also hugely beneficial for the skin, but not all formulas are created equal. The type most recommended by me is LivOn's patented Lypo-Spheric Vitamin C, which encapsulates the C molecules in liposomes made from essential phospholipids that protect it from destruction by your digestive juices. This means it’s transported directly into the bloodstream - and into the cells – to help protect cells from the damage caused by free radicals and support a healthy immune system. Trilogy Vitamin C Booster Treatment (RRP $44.99) and Trilogy Vitamin C Moisturising Lotion (RRP $52.99) are available right now from selected Farmers, pharmacy, department and health stores nationwide. For more information, visit www.trilogyproducts.com.